If US Ouakam wins just one point during the three last rounds of the Senegalese Ligue 1 2010-2011, the Dakar-based club will win its first ever title – an amazing achievement for a rather modest club with limited resources. In this post I will present a player who should be regarded as one of the revelations of the season: Baye Oumar Niasse. Niasse is a versatile player who is comfortable playing as right-winger, attacking midfielder or center forward. Niasse has even featured at right-back for the Senegal U-23 national football team. Niasse is described as a physically strong player who is very enthusiastic, hard-working and dangerous in front of goal. As far as I know, Niasse scored his first goal for US Ouakam, and his first goal at top level, during the Senegalese Ligue 1 2008. 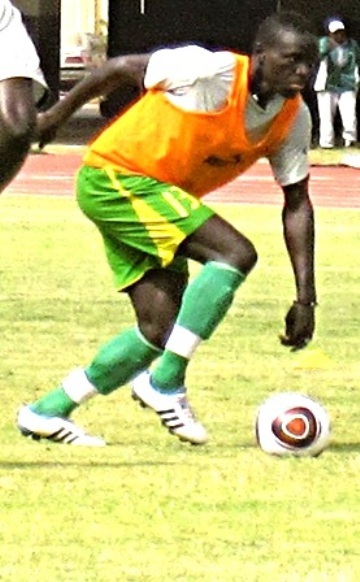 The same year, Niasse made his debut for the Senegal U-20 national football team. I can document that Niasse played for US Ouakam in the Ligue 1 2009 as well but I cannot find information about any goals. Niasse scored one of the twelve goals scored by US Ouakam during the Ligue 1 2010. It cannot be questioned that the current season has been the big breakthrough for the talented youngster. Niasse missed the six first matches of the season and made his first appearance on 06.02.2011 against Guédiawaye FC. Since then, Niasse has never looked back and today he is a key player for the league leaders. I can document that he has scored four league goals at the time of writing, including two match winning goals. According to “La Sénégalaise”, Niasse is born 18.04.1990 which should make him 21 years old at the time of writing. Based on his involvement with the Senegal U-20 and the Senegal U-23 national football team, I have no reason to distrust this information. Niasse is apparently 182 centimeters and 75 kilos. During the current season, Niasse has also forced his way into the Senegal U-23 national football team, participating in qualifying matches for both the 2012 Olympics in London and the 2011 All-Africa Games in Maputo. Niasse has also played in a couple of friendlies for the Senegal B national football team. Yesterday, Niasse was named in the squad of the Senegal U-23 national football team for the 2011 All-Africa Games in Maputo. The capital of Mozambique will most likely be invaded with scouts and it seems likely that Niasse will catch the eye of bigger clubs. The full name of Niasse is “El Hadji Baye Oumar Niasse”. His first name is sometimes written “Baye Omar” while his last name is sometimes written “Niass”. The picture is taken from “La Sénégalaise”. Tror du Niasse blir bra for Brann, Øivind?